In this episode, we have a very special CMOW segment, as Nick returns as our guest this week to discuss 1 Peter 1 and 5: “Stablish, Strengthen, and Settle You.” Also, Andrew will ask the question, “Are You Living in Idolatry?” in our encouraging segment this week. We also have the continuation of our Summer Comment Contest. That’s all in this episode of the Sharpening Character Podcast! 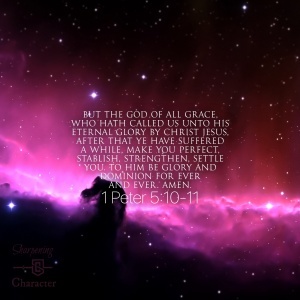 1:Peter 5:10-11. Download it here! Great topics this week guys! It is nice to have Nick back too! The VersePic is awesome!